CÉLINE. Just remembered that I forgot to show you guys a little something that I bought in Florence… this dream from Céline! I’ve been eyeing this bag for months and after using it for a photoshoot during the Firenze4ever event, I simply couldn’t resist buying it. 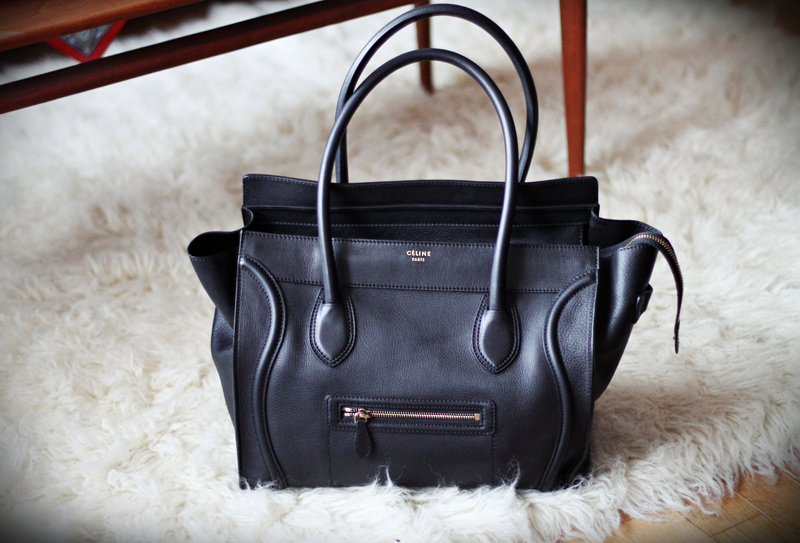 It matches all my criterias for the perfect black bag – it’s roomy, chic and timeless! You’ll be seeing a lot of this one from now on.. This entry was posted in Fashion, Inspiration, Shopping by Carolina Engman. Bookmark the permalink. It really stands out despite being black in colour! :) Love it! Wow! Great choice of Celine bags! yes it really is TIMELESS! Great pucrchase I am in love with it as much as you are!! SO JEALOUS! That Bag is GORGEOUS! That bag is freakin gourgeous!!! it’s such an elegant bag! Phoebe Philo has got the Midas touch! amazing bag!so simple and so elegant!!!!! great choice!!!! love the bag!! Wow Love it! Great classic look!! Nice bag. Very simple and chic. omg that bag is soooo pretty! must have been expensive!! but it is really chic! oh wow, i may be in love with that bag! ooo this is the version with long handles. I got the one with short, in orange/red SS11!!! super nice!!! today i posted the ingredients for CHICKEN WITH LEMON AND GREEN OLIVES light version!!! Amazing bag!! Great that you were able to get one in Florence. The cherry on top! your Celine bag is amazing!!!! Amazing… enjoy it to the max! That is one cool bag, just beautiful. I have this one too…love it! Great purchase, love this bag so much! Gorgeous bag, no doubt about it! And you can definitely see the quality of the leather. THE PERFECT SHOES, for the perfect bags! oh no you didnÂ´t! thatÂ´smy dream purse for the moment.. I LOVE LOVE LOVE LOVE LOOOOOOVEEEEE this bag!! its been my dream bag too!!! so jealous! i love your new bag…i cannot afford a Celine right now but i’m saving up for one of those amazing objects. Love your blog as always! great bag, but it does have a face! Hey Caroline! How much did you buy this Celine bag for? And in which currency?